Hi again, you sad your certs are expensive, maybe users can donate, or bye license of new version? :) Realy, program is very cool and users really need it. Hello, i hope you release new versions. its a nifty software. I also still love CryptoTE, the problem with releases is that the Windows binaries must be signed, and certs are expensive. The github repo has a few further commits. Love CryptoTE. are you planning to release a new version? @John: No, CryptoTE has no temporary files lying around. I hope to add in-memory locking someday. @Jean: Well, these days I could get a Mac, but am currently too wrapped up in other projects. That how life is. Does CryptoTE leave any clear-text work files lying around? I&apos;m trying it out on W98 and Lubuntu. Wondering: Did you ever get a hold of a mac and have you made a version that would also be portable for the mac? Thanks. Fantastic program.This is exactly what I was looking for! Thank You! Need to add the ability to copy/paste the encrypted text into a forum msg or email body directly, can&apos;t use a embedded file in such a case. Please add that capability. I&apos;ve been a solid booster and pushing out ton&apos;s of links to potential users of CryptoTE across Social Media and Linux Forums. Now we need that feature for copy/paste secure notes, posts without embedding any .etc file. Thanks. I&apos;m trying to find an easy way to send encrypted e-mails. It would be nice if the program would have some kind of an one click option to send the file(s) via an e-mail. That is probably a good idea. It wasn&apos;t included, because I wanted to avoid a .ini file, but that is now created anyway. A very interesting piece of software. Thank you. Are you planning an Android version? Since the various platforms share more and more data with each other, that would be for the use of cloud-based services extremely important and helpful. I love your CryptoTE but I hate Courier font. How can I change editors font in Windows 7? Hi JeIda, I also have an Android phone and got the same problem you have. I also took a short look and saw that the Java API contains all the necessary cryptography functions for CryptoTE. When I find some free time I&apos;ll give an Android version a shot. Have you considered a version for Android? Perhaps a simplified version. So that I can share passwords between my PC and Xpad? No real improvements are planned. Except maybe support for MacOSX, once I get my hands on a Mac. Other than that CryptoTE will just stay as it is, unless some OS changes require updates. CryptoTE will always be updated if it does not work. Love your CryptoTE. Easy and intuitive to use. It is just what I was looking for. 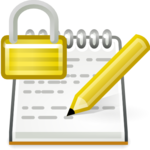 CryptoTE is a text editor with integrated strong cryptography. It is based on the popular Scintilla widget and automatically stores text data in secure encrypted container files. 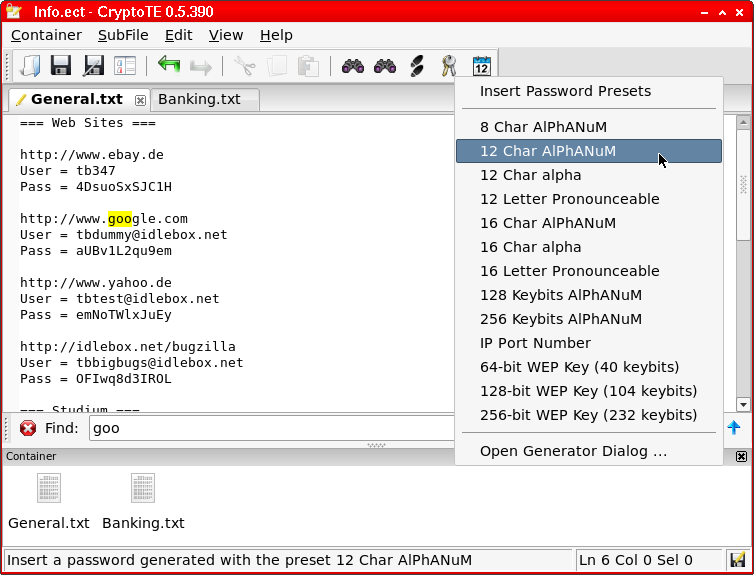 Compared to other "password keeper" programs, CryptoTE does not force any structure upon your data: it works with plain ASCII text and does not require you to fill in grids, key-value attributes, descriptions etc. Encryption is transparently performed using the highly-secure Serpent cipher. The editing interface is thoroughly optimized for speed and ease of use. Multiple subfiles, Quick-Find and a two-click random password generator make daily use very convenient. Transparent compression using zlib or bzip2 to reduce container size. Fast user-interface: Quick-Find and Quick-Goto bars like Firefox&apos;s find. I use the program myself almost every day. Automatically keeps the last n backup versions of the container file. Updated stand-alone binary archive with partially static Linux binary. Only X11 libraries are dynamically linked. Download cryptote-0.5.390.tar.bz2 (1.73 MiB) or browse the source code. The source code is released under the GNU General Public License v2 (GPL). Some parts of the source tarball is copyright of different authors. Answers to commonly asked high-level questions are published on an extra FAQ page. Please consult it and the documentation before writing me or posting a bug. Questions about cryptography and how it is used in CryptoTE are answered in the online help documentation, which is also included in CryptoTE and is available as PDF for printing. The documentation contains a short discussion about encryption, passwords and how you can protect for data. Advice on choosing a good password is also given. A much more technical discussion of CryptoTE&apos;s features such as the cryptography cipher is also given in the help document. The thoroughly technical container file format v1.0 specification is also available for review by interested fellow developers. A tutorial screencast showing how CryptoTE looks and how basic editing works is available for viewing online. More screenshots are available on the extra screenshot page.